Kenya — History will be made tomorrow, January 24, as the first dhow made from 100 per cent plastic makes its maiden long distance voyage from Kenya to Zanzibar. Named "FlipFlopi", it is the world's first dhow made from pure plastic trash collected from beaches and coastal towns. It is scheduled to sail from Lamu, at the Kenyan coast, to the Island of Zanzibar on a 14-day trip. It is expected in Zanzibar on February 7. During the trip, the traditional dhow made of recycled plastic will make a number of stops along the way to raise awareness about the over 12 million tonnes of plastic waste being dumped in the ocean every year. Tourism operators and conservationists in Watamu are gearing up to welcome FlipFlopi to the coastal town on January 26, as she makes a stop-over on her trip. Hemingways Watamu, one of the partners of this initiative, will host the FlipFlopi expedition crew when they stop over at Watamu Marine Park during which presentations on clean beaches and recycling will be made. "We are among the champions of clean oceans with our continuous support of beach cleanup exercises along the Watamu coastline. Over the years, we have worked with our fellow community members to clear plastics from our beach and convert them to better use and are actively reducing single use plastics used in our properties throughout Kenya" said Hemingways Collection Operations Director, Mr. Ross Evans. Hemingways Collection Operations Director Ross Evans. Over the years, the five-star luxury hotel has partnered with the Watamu Marine Park, the Watamu Marine Association and EcoWorld Watamu Recycling Centre to raise awareness about plastic waste and promote the blue ocean economy through recycling and commercialization of the collected waste. Mr. Evans applauded the FlipFlopi initiative, terming it a huge boost to ecotourism, the hospitality industry and in pushing forward the blue economy agenda. "We greatly support this initiative in partnership with the UN Clean Seas Campaign as it benefits the ocean's natural habitat, the society and is in line with Blue Economy and Kenya's Vision 2030 for sustainable development," he said. The FlipFlopi is a project aimed at stemming the flow of up to 12 million tonnes of plastic waste dumped in the ocean every year. 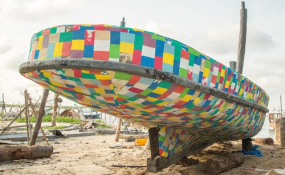 The nine-meter long sailing boat was built out of 10 tonnes of plastic waste and thousands of repurposed flip flops making a successful launch in September 2018. The dhow which has now partnered with UN Environment Clean Seas campaign will seek to join nine other African countries in the fight against marine pollution and highlighting the potential of 'already used' plastic. The FlipFlopi project (volunteer run group) was founded in 2016 by one Ben Morison who was inspired to come up with the idea after witnessing the shocking quantities of plastic on Kenya's beaches. The project is based in Kenya and its name comes from the fact they are using flipflops - the biggest component of their beach clean-ups (not surprising given 3 billion people on the planet use them) - to cover the entire outer layer of their 45 tonne dhow. The Hemingways Collection consists of Hemingways Nairobi, Hemingways Ol Seki Mara, Hemingways Watamu and Hemingways Residences. Hemingways Watamu is a tropical paradise for snorkelling and diving amongst breathtakingly beautiful coral and multi-coloured sea-life.